Our RV electricity editor Mike Sokol will appear live today on the syndicated radio program, The RV Show USA between 4:30 p.m. and 5:30 p.m., Pacific Time. That’s 7:30 p.m. to 8:30 p.m. Eastern Time. The show is taped live on Facebook to be broadcast later on radio stations across the USA. You can watch the live taping by clicking here. During the show, please call in with your questions for Mike toll free at 1-855-296-7469. 12-volts DC can be dangerous too! 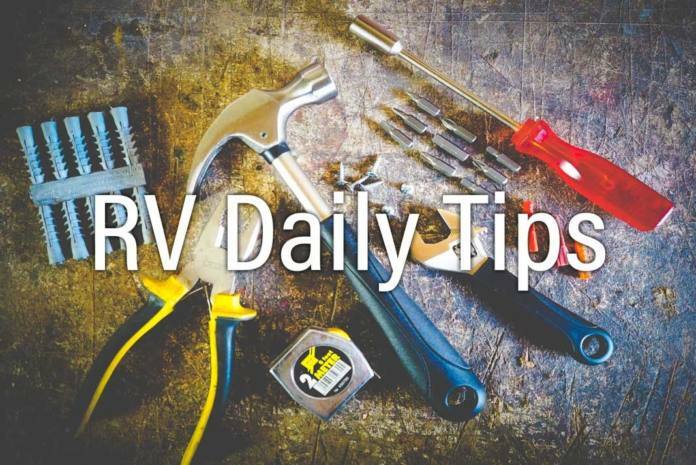 Be aware that your RV’s 12-volt electrical system can be dangerous to work on. While 12-volts DC is too low to shock you, there are many hundreds of amperes of current available for a short circuit. If you accidentally get anything metallic between the terminals it can weld itself in place and turn red hot in seconds. That includes anything metallic that gets between the red/positive battery terminal and the frame of the RV. Remove all watches and jewelry when working on or around your battery. If you’re going to be removing the battery cables make sure you remove the black/negative one first. After, it will be safe to put a wrench on the red/positive battery terminal to remove it. When reattaching the battery cables, put on the red/positive terminal first, followed by the black/negative terminal. If you don’t do it in this order then you can easily have the wrench that’s on the positive terminal contact the RV frame which will create an instant weld followed by overheating. If you short a battery it’s possible to cause the battery to vent acid out the top from internal overheating. How do I know all this? Seen it. I watched my dad short out a car battery and take a hit in the eye from the acid squirting out the vent holes. At a car shop where I once worked, a mechanic got his wedding ring trapped between his wrench on the positive battery terminal and the vehicle frame. It welded the wedding ring in place and glowed red while it was still on his finger. He nearly lost the finger from 3rd degree burns along with tendon damage. Watch for a video from me on this topic soon. Read yesterday’s tip: Watch out for those sneaky RV weight limits. Limited space in your RV’s bedroom? Where to keep all that “pocket junk” men have to carry (because “real men” don’t carry a purse)? Try a small plastic tray where you can dump your keys, wallet, sunglasses, etc. Have bigger stuff, like iPad, water bottle, book? Just use a bigger plastic tray. 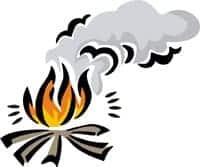 If you are allergic to smoke or bothered by it, then be sure to plan ahead when making a reservation at an RV park, especially during the summer season when many campers will enjoy an evening campfire. With some parks, the fire pits can be as close as 15 or 20 feet away from a neighbor’s RV. When making a reservation ask for a site away from a nearby campfire pit or in a no-campfire area of the park, if available. Trailer folk: Jack the frame – not the axle. You may know this website from our newsletter (we love these guys), but if you’re not familiar with it, make yourself! Find almost every free overnight parking spot across the U.S. Ever want to sign up for a website but not get put on a million mailing lists? (This always seems to happen, right?) 10-Minute Mail gives you an email address to use for 10 minutes – then it disappears. Keep this on file. Trust us, it’ll come in handy. Unsure about the safety of your next campground location? Crime Reports uses a Google Map-style system that allows you to see every bit of crime in any specified neighborhood. Look at the neighborhood you’re currently in, or where you’re headed next! A fascinating short video on why weight distribution on your trailer matters so much. In this demonstration, you’ll see how the trailer responds according to how its weight is distributed. If not loaded properly a trailer can sway out of control and lead to an accident. If it’s not at Amazon.com it’s probably not easily available anywhere! Check out this huge selection of power tools — drills, saws, air compressors, impact wrenches, car vacuums, sanders, polishers, tool boxes — the list goes on! See what’s available and maybe pick up a great deal! Want easy fire starters for your campfire? Get a single one of those manufactured fire logs, cut it up in pieces, and use the pieces for fire starters. Putting away a recently used sewer hose can make a wet mess. After rinsing the hose, leave the “output” end of the hose connected to the drain, and starting at the RV-end of the hose, push a couple of feet of hose toward the output end. This forces the water out of the pleats of the hose. Wait a moment, and then repeat the process until you’ve pushed the hose together and the water out. Now store your hose without the watery mess. Remove ugly black streaks from your RV! Here are today’s Zip and Postal Codes. If you’re the winner, let us know immediately. If you are, you’ll win $70. Good luck! Like several others, ours was a VW pop-up van. Put 125,000 miles on it. Traveled with two kids and a dog. Wish we still had it. First RV was 1965 VW Kombi bus with Nothing in it. Added plywood bed on left side and shelves behind bench front seat. 250,000 miles, including Fairbanks to San Salvador and coast to coast. My first RV was a VW pop-up camper model! Drove 18,000 miles in 3 months! Oh, what an adventure! I was 23 years old! Ten Minute mail? Why not just sign up for an additional Gmail account and use that to sign up for sites that may send junk. The gmail junk mail filter is pretty good too so you really will not see all that much when you open it to click on a confirmation link. I also use mine to get junk I may want like reward coupons from restaurants and retailers. I save my personal account and the one primarily tied to my Android phone for close friends and family only. Those really inexpensive (cheep) bathroom exhaust fans really do make a lot of noise! Your article on fixing that seems to lack a place to find such a fan! If your referring to actual computer fans, as I remember them, they screamed so loud you needed ear muffs to muffle the sound. I did a search & really didn’t see anything. Any chance of a actual install or a web site that sold said fan. Back when I was a pup, I carefully used my hand to isolate a wrench from a battery terminal. Problem was, there was a ring on that hand. It started to short the battery, and heated up so fast that it “welded” the wrench-to-ring-to-battery connections instantly (like an arc-welder). Fortunately for me, it was a cheap ring, and broke in pieces. Second-degree burns and I still have that finger with no lasting damage, but a LONG lasting memory. My first MH was a Blue bird school bus that I converted in the late 60s it was 25ft long and I added a porch on the rear. Our first trip was from Maryland to Colorado springs with many stops along the way mostly boondocks.